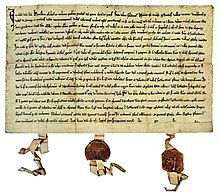 The Federal Charter or Letter of Alliance (German: Bundesbrief) documents the Eternal Alliance or League Of The Three Forest Cantons (German: Ewiger Bund der Drei Waldstätten), the union of three cantons in what is now central Switzerland, formed in early August, 1291. The league was set up as a league for defense purposes against any attacker, probably prompted by the death of Rudolf I of Habsburg on July 15, 1291. Before his death, Habsburg attempted to reinforce his claim over Schwyz and Unterwalden, which meant a succession of military interventions. IN THE NAME OF GOD - AMEN. Honour and the public weal are promoted when leagues are concluded for the proper establishment of quiet and peace. Therefore, know all men, that the people of the valley of Uri, the democracy of the valley of Schwyz, and the community of the Lower Valley of Unterwalden, seeing the malice of the age, in order that they may better defend themselves, and their own, and better preserve them in proper condition, have promised in good faith to assist each other with aid, with every counsel and every favour, with person and goods, within the valley and without, with might and main, against one and all, who may inflict upon any one of them any violence, molestation or injury, or may plot any evil against their persons or goods. And in every case each community has promised to succour the other when necessary, at its own expense, as far as needed in order to withstand the attacks of evil-doers, and to avenge injuries; to this end they have sworn a solemn oath to keep this without guile, and to renew by these presents the ancient form of the league, also confirmed by an oath. Yet in such a manner that every man, according to his rank, shall obey and serve his overlord as it behooves him. We have also vowed, decreed and ordained in common council and by unanimous consent, that we will accept or receive no judge in the aforesaid valleys, who shall have obtained his office for any price, or for money in any way whatever, or one who shall not be a native or a resident with us. But if dissension shall arise between any of the confederates ("inter aliquos conspiratos") the most prudent amongst the confederates shall come forth to settle the difficulty between the parties, as shall seem right to them; and whichever party rejects their verdict shall be held an adversary by the other confederates. Furthermore, it has been established between them that he who deliberately kills another without provocation, shall, if caught, lose his life, as his wicked guilt requires, unless he be able to prove his innocence of said crime; and if per chance he escape, let him never return. Those who conceal and protect said criminal shall be banished from the valley, until they be expressly recalled by the confederates. But if any one of the confederates, by day, or in the silence of the night, shall maliciously injure another by fire, he shall never again be considered a fellow-countryman. If any man protect and defend the said evil-doer, he shall render satisfaction to the one who has suffered damage. Furthermore, if any one of the confederates shall spoil another of his goods, or injure him in any way, the goods of the guilty one, if recovered within the valleys, shall be seized in order to pay damages to the injured person, according to justice. Furthermore, no man shall seize another's goods for debt, unless he be evidently his debtor or surety, and this shall only be done with the special permission of his judge. Moreover, every man shall obey his judge, and if necessary, must himself indicate the judge in the valley, before whom he ought properly to appear. And if any one rebels against a verdict, and, in consequence of his obstinacy, any one of the confederates is injured, all the confederates are bound to compel the culprit to give satisfaction. But if war or discord arise amongst any of the confederates and one party of the disputants refuse to accept the verdict of the judge or to give satisfaction, the confederates are bound to defend the other party. The above-written statutes, decreed for the common welfare and benefit, shall endure forever, God willing. ln testimony of which, at the request of the aforesaid parties, the present charter has been drawn up and confirmed with the seals of the aforesaid three communities and valleys. So done in the year of the Lord 1291 at the beginning of the month of August.